A week ago I sat down after work in a Pioneer Square pub with five young men to discuss the Transportation Element and Transportation Appendix of the Draft Environmental Impact Statement for Seattle 2035, Seattle’s Comprehensive Plan for growth over the next 20 years. These are smart, responsible young men, who were drawn to an off-hours analysis session in part because they are policy wonks, and in part because they feel a deep sense of civic responsibility. Several of them have young children. And these young men are staring down the road at their future, a future they feel responsible for, in a region and a planet that will be vastly different than the place we inhabit today. I’m setting the context because the realities of the future guided our discussion. We want our city to contribute to a livable planet. We want a city where living without a car is an easy, affordable, and realistic choice. Use a multi-modal, person-trip level of service standard rather than a vehicle level of service. Count trips, not just commute trips to work. Make sure Seattle 2035 is in alignment with existing Seattle plans. Build transportation models that push the envelope rather than following business as usual. Rather than measure and base our transportation network on roadway capacity for vehicle-only level of service, measure the through-put of people – walking, riding buses and trains, in delivery vehicles, riding bikes, driving cars. The metrics we set for “person-trips” will help us fund and build the complete networks we want in the future. Nearby Bellingham and Bellevue have great models for us to study. We’re changing how we work and we often work from home. Our trip to work represents only a fraction of where we travel. We go to schools, parks, bars, and out to visit friends. 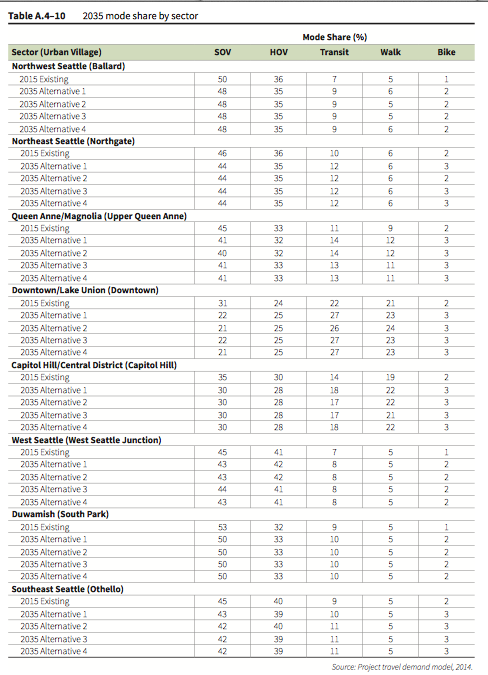 The Puget Sound Regional Council collected fine-grained analysis of different trips we make during the day. Let’s make sure our 20-year transportation planning models reflect the variety of places and ways we travel as well. We’re especially happy that the Climate Action Plan expects just 25% of us to drive to work alone by 2035 (could we do even better?) and expects transit boardings to increase by 37% by 2040. We’d like to see Seattle 2035 be clear about which plan alternatives greatly increase the possibility we’ll reach our goals for Vision Zero, the Climate Action Plan, transit, and active transportation modal plans. The current DEIS for the Comprehensive Plan assumes Seattle’s walk/bike/transit plans will fail by projecting mode shares that don’t change very much from existing conditions. This is flat-out wrong. According to our mode plans we will be walking, biking, and riding transit a whole lot more in 2035 — and our Comprehensive Plan needs to reflect this welcome reality. What kinds of land use plans would inspire developers to be motivated to build properties that minimize auto trips? How can levels of service be used to fund multi-modal street improvements? What would a car-free downtown look like? What would happen if the city no longer subsidized free parking? We encourage the City to make one “visionary” alternative of Seattle 2035 that reflects new assumptions for the trips we make and that dramatically reduces our greenhouse gas emissions. After a beer (and a soda for the gluten-free young man), and a long discussion, and a flurry of emails, we still feel a deep sense of responsibility to our future city, and a desire to support Seattle government as it plans for our common future. We look forward to living in a great city in 2035!